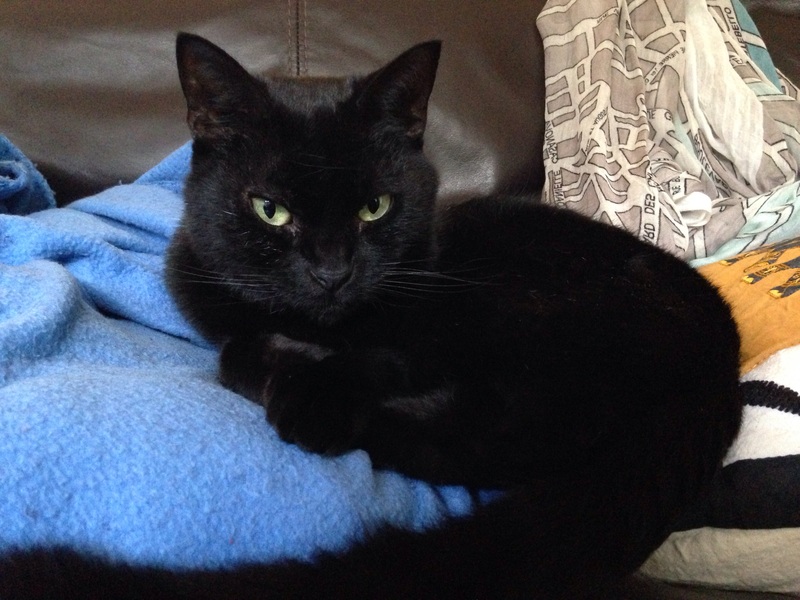 Louis Catorze is a small, scraggy black cat who came to live with us in 2014. He was already called Louis when we got him, but his subsequent nicknames (The Sun King, Le Roi Soleil etc.) mainly come from a silly pun on the word “cat” and the French number 14. It was hilarious at the time, as was the fact that a black cat with freakishly long protruding canines looked more like the Prince of Darkness than the Sun King. Curiously, we later discovered that he is, in fact, our 14th family cat, if you count all my childhood ones including the various strays that I bulldozed my mum into adopting. We suspect, however, that, despite his regal title, Louis Catorze doesn’t actually speak a great deal of French. He also has the rather less desirable title of being the most expensive cat in the history of his former rescue centre, and not in a good way: due to a skin allergy of unknown source (although much of the evidence so far points to dust mites), Louis Catorze racked up thousands and thousands of pounds of veterinary treatment whilst in their care. We can only imagine the joy, the relief, the leaping up and down and punching the air, when we came along and took the itchy little money-haemorrhaging (still not quite sure about the spelling of that word) beast off their hands. Louis Catorze now lives a peaceful life in his very own Palais de Versailles (actually a terraced house in London but, because he is small, it must seem like a palace to him), and he spends his days sleeping, scratching, meowing at bugs like an idiot, and not doing a lot else. He often receives visitors (feline and human) at Le Palais, as well as letters and gifts from people who have never even met him. In fact, he’s more popular than we are. Nothing would delight me more than people following our blog, but please note that I am neither a vet nor a cat behaviourist. Nor am I even a particularly experienced cat owner, as Louis Catorze is only the 3rd cat I have had as an adult. By all means ask me questions about your own cats and I will endeavour to help if I can, but bear in mind that my responses will largely be based on opinion, gut instinct and, very occasionally, hearsay and gossip. You will instinctively know far better than I, what is best for your cat. And, if something is seriously wrong, a visit to the vet is in order (even though kitty will hate you for it). I so like your writing style!! And I love to read about Louis too, so keep on the good work! Thank you! It’s lovely to have so much support. Could Le Roi become more famous than his YouTube comrades who actually DO things? Who knows? I bet he will !! I love this photo of dear Louis. Merci! “Vive anything, really” is the best motto EVER. The prefix Hemo- referrs to blood. It was shortened from a Latin word Haemo, and in the past, and in the UK, using Haemo- is more common than in the US. But both spellings are correct. Bijou the cat thanks you for liking our blog and thinks your adventures, M. Quatorze, are quite lively and we plan to follow alone!!!! I wish Bijou & Le Roi could meet! Wow. I also have an all-black cat with protruding canines! Weird cat ladies, unite!